Being just fifty minutes from downtown Tokyo, Kamakura is the closest day trip and incidentally the most noteworthy for those in Tokyo. If one had to choose between Nikko, Hakone and Kamakura the choice would clearly be Kamakura. Kamakura is in fact so packed with sights to see that if one was just on foot it would take a few days. In light of this fact people often rent bicycles to enable them to be more mobile. It is not surprising that this town on the shore should be one of the top tourist attractions in all of Japan, for here was the center of Japan from 1192 to 1333, during the Kamakura Period, where Japan was ruled from this very city. 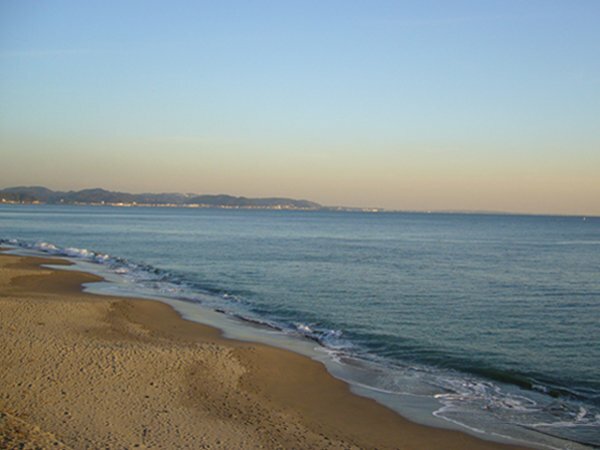 And as you might assume the area has as superfluity of temples, shrines, trails interspersed with a few museums, galleries and if that wasn’t enough Kamakura has some of Japan’s most famous beaches: Zaimokuza Beach and Yuigahama Beach. Toshimaya’s not only got your souvenir hookup at has Kamakura’s signature ‘dove cookie’. 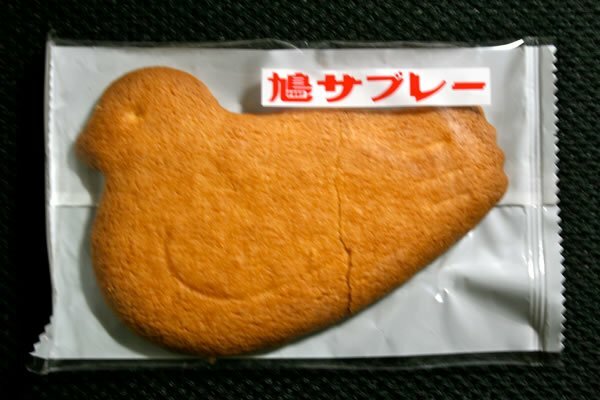 While probably over-rated, the ‘hato sabure’ (dove cookie) has become one of the symbols of Kamakura and something every one eats when they visit. It is simply a butter/sugar cookie in the shape of a dove. They cost around 90 yen. 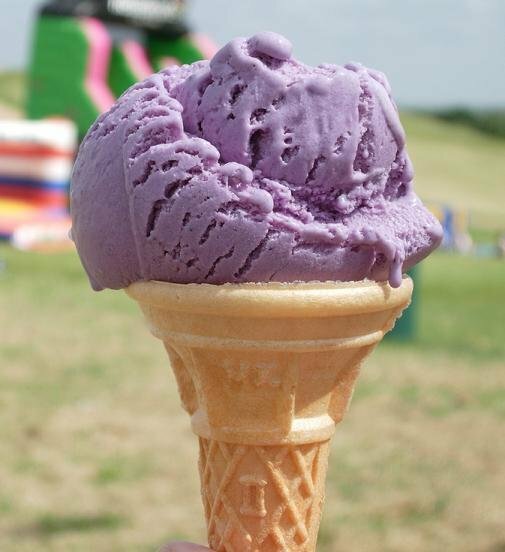 Another local snack is purple sweet potato ice cream, don’t worry! As strange as it sounds we swear it is delicious. As with Senei and Hato Sabure you can find the purple ice cream at any snack shop in Kamakura. We recommend ‘Imo no Kichikan’ who are particularly famous for their potato ice cream. The ice cream is soft served and will cost you about 300 yen. Possibly the most well known of all snacks in Kamakura and certainly the most stereotypical, these rice crackers are baked fresh daily (and sometimes right in front of you). Flavors vary from savory to sweet, some are served with a sheet of nori (seaweed). 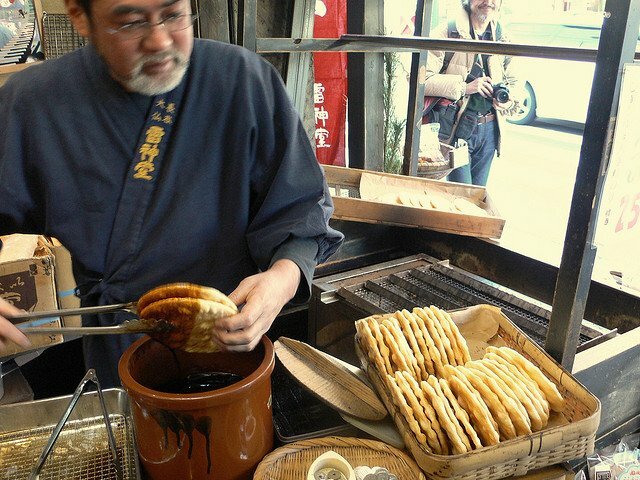 Senbei are rather delicate in their taste and to some, may seem to be lacking a certain punch. That being said we challenge the adventurous traveler to purchase to plain senbei with no spice (preferably a sweet senbei), and then purchase a soft served purple sweet potato ice cream and make a sandhich. You could even try the Hato Sabure for that mater. Either way the combination of these two local favorites will be sure to please and probably turn some heads. 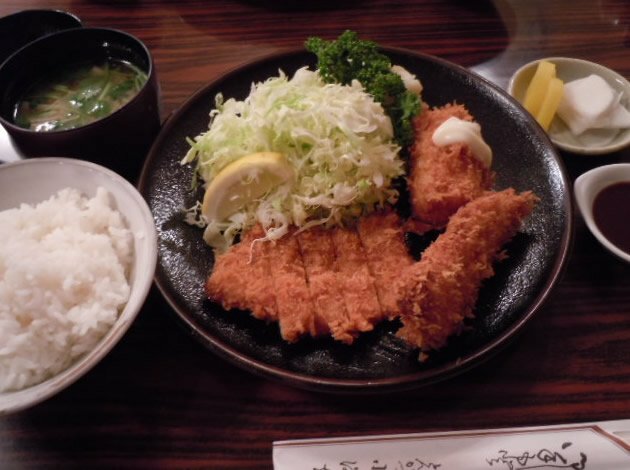 Kamakura’s Konichi Tonkatsu has been serving up fried pork for over fifty years. This endurance has earned it a reputation for some of the best katsu (fried pork) in Eastern Japan. The meat is very tender and is described by some customers to ‘melt in your mouth’, due to its popularity and high demand there is usually a wait ahead of you. If you want the 100% authentic eating experience while in Kamakura, then you’ll need to check out ‘Usagi’ and when you arrive make sure you order the deep fried pumpkin (if in season), as well as the specialty dish: “Usagi Salad”, which consists of slices of chicken and omelette over chopped apples and assorted local veggies. The name literally means Fireworks Ramen, and with a name like that you can’t help but anticipate the sensational time you’ll soon be having. 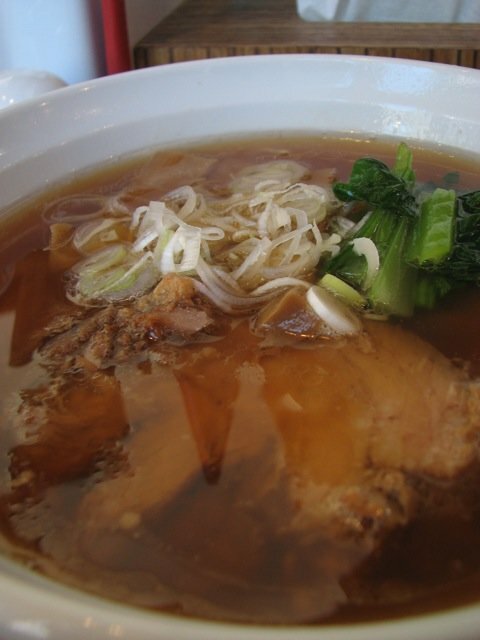 The shouyuu ramen is recommended (soy sauce). Expect to pay 780 yen for your bowl of ramen, which is pretty standard for a bowl of ramen, but you’ll be glad you did. They also offer ‘tsukeme’ ramen which is ramen noodles which you dip in a sauce. Built in the year 1282 the Engaku-ji Temple is one of many UNESCO World Heritage sites in Kamakura. 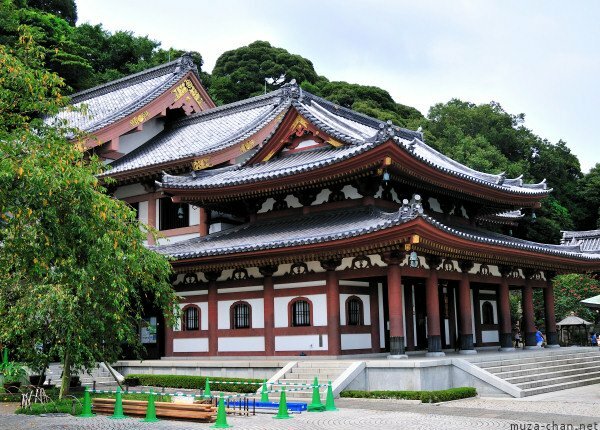 The Sanmon Gate to the Temple is said to be able to free an individual from obsessions and therefore bring about enlightenment, while this remains to be seen why not give it a try? 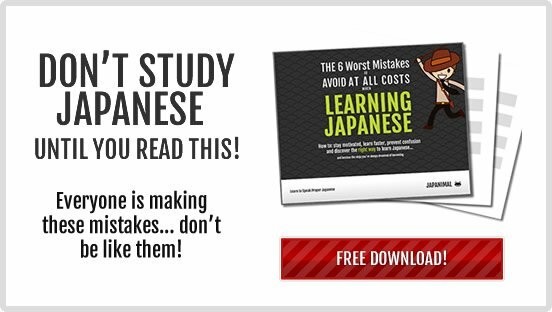 The most you have to loose is 300 yen. Shortly before the Engaku-ji the Kencho-ji Temple was erected in 1253. Its claim to fame is the fact that it is the first Zen Dojo built in all of Japan. The temple has a rather large gate, which towers over at over 30 meters. The main artery of Kamakura, this street has the majority of your shopping and restaurants on it. It starts behind Kamakura station (at the Hachiman-gu Shrine) and goes all the way to the beach. The original center of Kamakura, built by the shogun himself Minamoto Yoritomo nine hundred years ago. From the top floor you have a panoramic view of Kamakura, where you can look down on the city just as the shogun did 900 years before you. Continue your fun and education at the Kamakura Kokuhokan Museum where you can look back at the Kamakura Period like a window into the past. 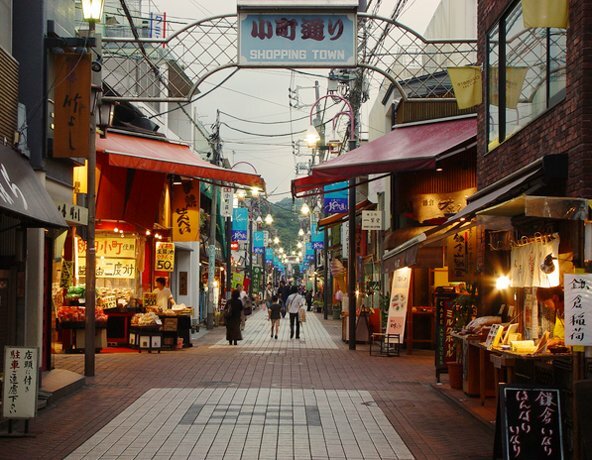 A section of the Wakamiya-oji, Komachi-dori (street) is crammed with souvenir shops, restaurants, craft shops, everything you’ll want to buy and eat you’ll find here. 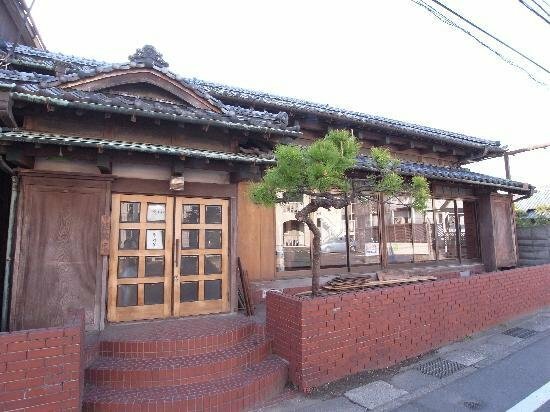 For further edification into the history and culture of Kamakura, you’ll also find the Kichoan Museum on Komachi street. 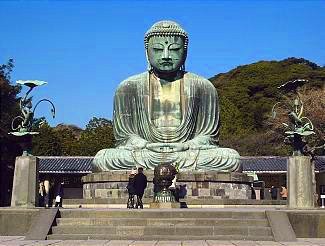 At last we’ve come to what you’ve all been waiting for, the pride of Kamakura: Daibutsu (Great Buddha). The 120 ton, 13 meter tall Buddha made its debut in 1252. It is without a doubt the most photographed feature in the city. 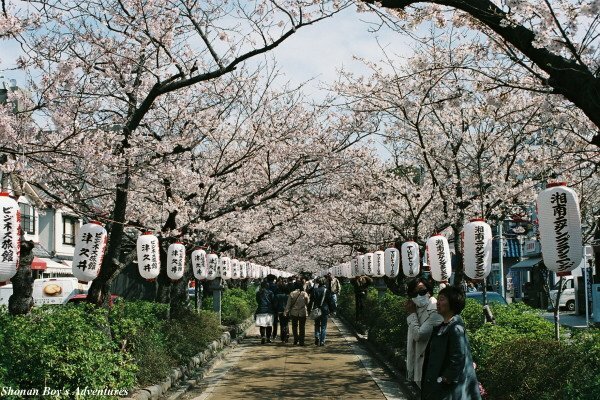 During spring time the statue’s neighboring cherry blossoms bloom creating a most magnificent image. If it had not been for a tsunami 500 years ago this Buddha would be inside a temple, however the temple was completely destroyed and washed away, but it could not wash away or destroy this steadfast statue. Take trip in a time machine and check out the Hesa-dera Temple. You’ll be going back 1300 years... to the year 736. One of Japan’s oldest temples, its needless to say the Hase-dera pulls in a lot of tourists. The temple is near the sea and offers a fantastic view of the coast and ocean. Weather permitting you can enjoy a delightful stroll (preferably in the warmer months) along the yuigahama beach. And if the weather is even better you’ll be able to spot Mt. Fuji off in the distance. Being a tourist town you won’t be able to walk a block without running into a tourist shop. Here is where you can find both the kitsch and the traditional intermingled, from hand carved kokeshi dolls to neon colored jellie Buddhas. You will find the highest concentration of said stores near the train stations: Kita Kamakura, Kamakura, Wadazuka, Yuigihama, Hase. With rooms starting at a steep $250 a night you’ll find the Kamakura Park Hotel to be the most expensive and elegant hotel in the area (however if it is not posh enough for your tastes then you could quite realistically lodge in Yokohama and take the train in to Kamakura for your sight seeing). The Park Hotel is designed in the European style, with liberal use of floral patterns and marble. You’ll have access to free wifi, free parking, and LCD TVs. The hotel is noted for its specialty in the French culinary arts. 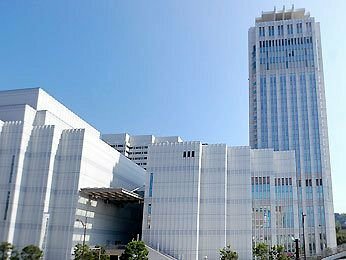 With rooms starting only at $44 the Kamejikan is an excellent choice for those who want to save a few bucks. 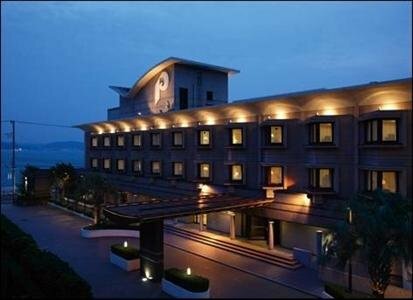 (Compared to the Park Hotel which is 5x the price) Keep in mind however, that this is a mixed dormitory and such living conditions are not for everyone indeed (However the budget traveler would be most interested). The Kamejikan has free wifi, shared bathrooms and a shared Kitchen. It is conveniently located right on Zaimokuza beach. If you’re not satisfied with what you can find in Kamakura proper then by all means think outside of the box and seek accommodations elsewhere, specifically Yokosuka. Just five train stations South of Kamakura (by the JR Yokosuka Line) it serves as an excellent base for your Kamakura Adventure. A single occupant standard room will come in near $105, and a double occupant around $135. Travelers are apt to favor the Mercure over the Kamakura Park Hotel, as it is newer, fresher, more modern and just feels more crisp. Rooms come complete with all the modern necessities: free internet, LCD TV, coffee maker, blow dryer, etc etc etc. A far more affordable and sensible way is to take the JR Yokosuka Line from Tokyo Station directly to Kamakura station. The fee is only 890 yen and the trip is a very fast 56 minutes, making the shinkansen option only a few minutes faster.